I have seen program in link. its not complete program. Also I didn't understand keypad reading functions. I am trying to understand keypad reading in c programming. Please help me..
As a starting point, can you tell us how much of the tutorial example you understand ? Do you have access to the Proteus program to simulate a circuit ? I understand logic of keypad but I am having difficulties to implement program. That's the reason first I tried to implement function for keypad reading. I have simulator software. 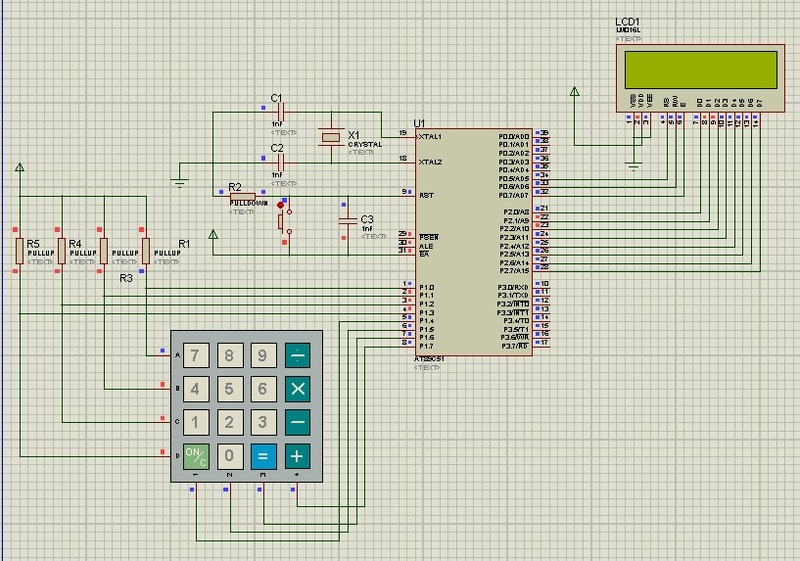 I can simply add keypad and lcd to 8051 controller. In tutorial, there is only program for keypad interfacing, no program for both lcd and keypad. I wanted to see sample example for lcd and keypad interfacing program. once I see its working on proteus. I can try to understand the whole program. I have keil compiler and at89c51 controller. Here is a version of the tutorial that reads a key and prints it to a serial terminal. There is also a Proteus project to run the program and display the code as a hex value. Please see the below code. I have taken idea from your code to read keypad. there is no error in code but it doesn't print anything on screen. Can you post your Proteus files. You will need pull-up resistors on port 0. Add pull- ups for EN and RS. R1,3,4 and 5 are not needed.